Recently I was asking a group of women chefs I am friends with for their best sausage ball recipe. You know, the kind with sausage, baking mix and cheese; that infamous holiday party appetizer it seems everyone makes. Welllllllll ... none of them had one ... GASP ... a few had never even heard of them, say what? Finally one of them mentioned a "stuffing" ball recipe they made and really liked, so being intrigued now, I asked about it since I'm all about stuffing. 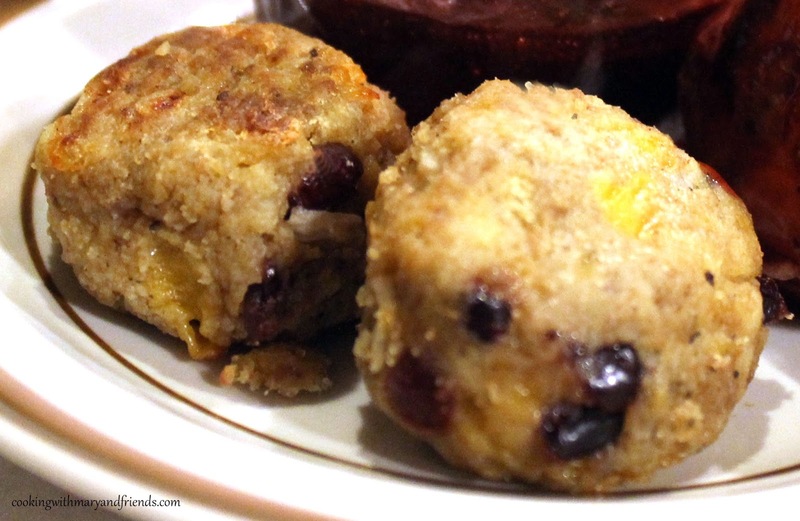 Who doesn't like stuffing and, oh my goodness, these little round balls of stuffing are my new fav! I like to make my own New England Bread and Sausage Stuffing, so I chose to use torn white bread instead of store-bought stuffing mix, but you can certainly use either one. Then there is the addition of the chopped dried cranberries and the shredded cheddar cheese that just puts these little stuffing treats over the top, believe me ... soooooooo good. They are the PERFECT party appetizer. I've made a couple batches now as a trial run just to see how we'd like them, and my husband is addicted to them, he loves them. Brown sausage in large skillet over medium heat. Add seasonings and cook until pink is gone. Add onions and celery to skillet and continue to cook until vegetables are soft and onions are clear; drain grease and allow to cool for 10-15 minutes. In a large mixing bowl add cheese, cranberries, torn soft bread or stuffing mix and spoon in sausage mixture. Stir in eggs and chicken broth and make sure entire mixture is completely combined (I use my hands). Add more chicken stock if needed; mixture should hold together and not be too dry or too sticky. 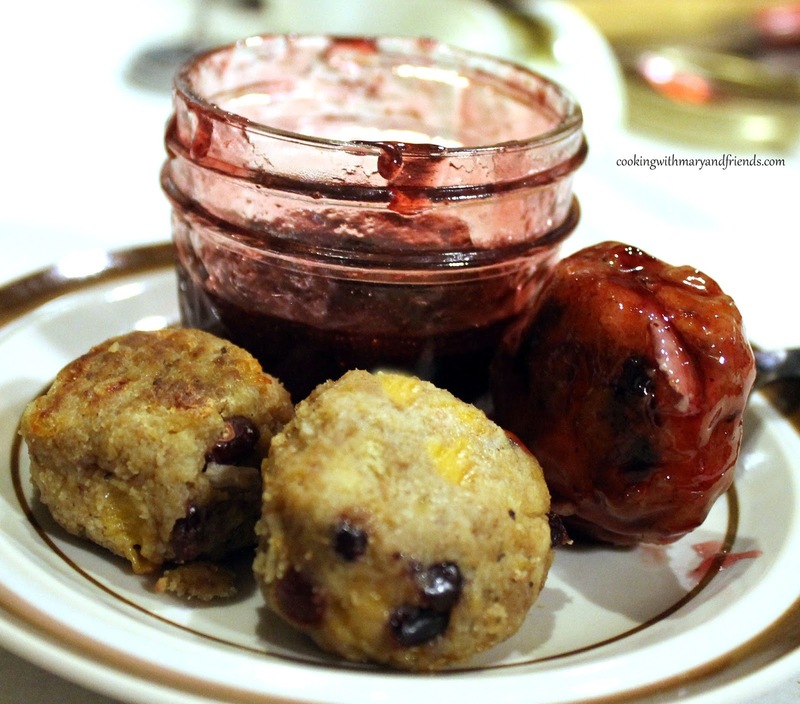 Use a cookie scoop, or your hands, to scoop out balls of mixture, and shape into balls. 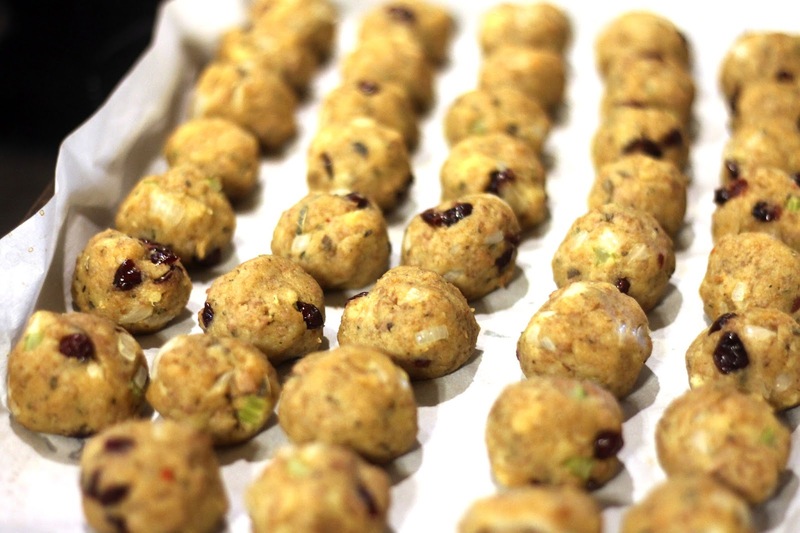 Place balls onto a cookie sheet lined with parchment paper. 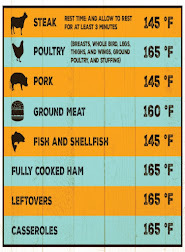 Bake in a preheated 375º oven for approx. 15 minutes, or until tops begin to brown. 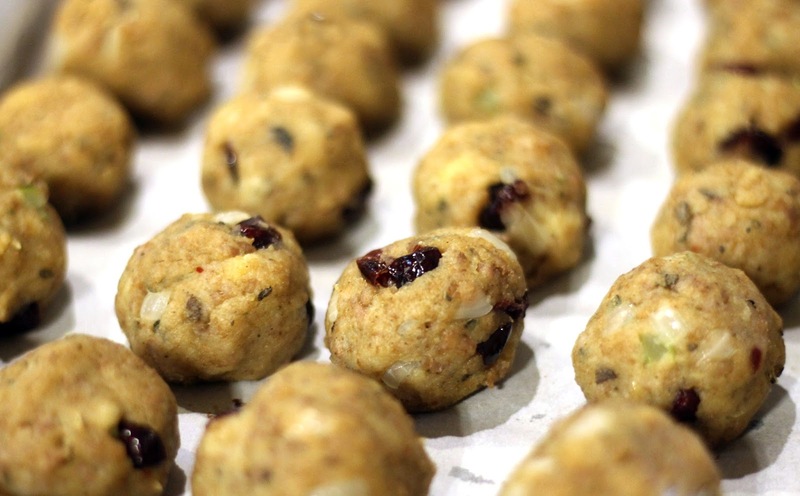 Makes 36-48 Sausage and Stuffing Balls, depending on the sizes you create. Cook's note - Stuffing balls freeze very well. When you're ready to serve, thaw and reheat in a 375º oven 5-8 minutes, or until heated through.